Welcome to 2016! In the last week Iran and Saudi Arabia have been at each other’s throats, the gun debate in the US has reached a tipping point, and North Korea has claimed a successful hydrogen bomb test. In celebration of the new year let’s take a look at a comic that also discusses new beginnings, and how the past continually haunts us. 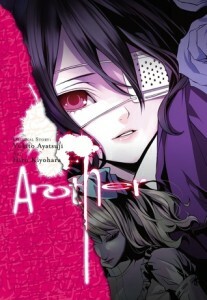 Another is a horror mystery from Naoyuki Uchida, aka Yukito Ayatsuji, husband of Fuyumi Ono aka the author of The Twelve Kingdoms. Originally published as a novel in 2009 by Kadokawa Shoten, in three short years the book rocketed in popularity due to its frightening atmosphere and bizarre premise. The 4 volume manga, which will be the focus of today’s article, was serialized from May 2010 to January 2012 in the seinen magazine Young Ace and released as an omnibus in America under Yen Press. An anime soon followed from January to March of 2012, followed by an OVA in May 2012, and a live action film in August 20121. The reader follows the curse that has plagued class 3-3 since 1972. In that year one of the class of 3-3 met his untimely end and his class, too distraught to deal with the death, continued to act as if the deceased student was still there. Even the teacher went along with the charade. Mysteriously, ever since then class 3-3 has been haunted by seemingly senseless deaths. When transfer student Koichi Sakakibara arrives he is completely in the dark as to the fear that permeates from his classmates. As the story unfolds we see that there is a strange logic to the curse and over time we realize how the loner Mei Misaki plays a pivotal role in all of it. I can’t say that I’ve read the original book (now available from Yen press in two volumes), but I have seen both the anime and read the manga. In both the anime and manga the story slowly and deliberately unfolds in a well thought out fashion, dropping hints and cold leads along the trail to the finale. The finale, by the way, is a very very good reason to pick this manga up. Don’t watch the anime before reading the manga though. Without giving too much away, the ending of the anime is far more dramatic and over the top than the manga; although the anime feels more in keeping with the rising hysteria of the class 3-3 students. The manga, on the other hand, keeps it small and poignant by containing the drama almost entirely between Mei and Koichi. This unfortunately means that the rest of the characters in the class doesn’t get explored as much as in the anime, an oversight that works in the context of the book, but doesn’t lend itself too well to fleshing out the world of Another. As a side by side comparison the manga is a decent starter to the story in the anime with the exception of two flaws. If you watch the anime before reading the manga then the shock of the reveal at the end of the anime is dimmed in the manga because of the extra attention that is paid to “the Casualty”. 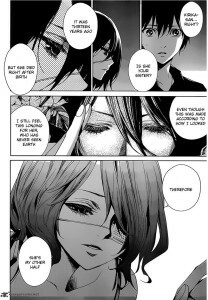 I won’t go into further details because I don’t want to spoil the ending, but suffice to say Hiro Kiyohara provides more screen time to “the Casualty” than the anime, as if wanting to explore the experience of the person who holds this fatal role. The artwork can be jarring for some readers as Kiyohara draws scenery sparingly. Rather he relies on dramatic flashes, flares and mist created with tone sheets. I know, it sounds like a nit-picky thing to point out, but in a mystery horror story that relies so much on the time and place of events it’s easy to lose track of location without description of the scenery. The atmospheric use of pen and tones can only be so effective when you feel like you’re journeying through a literal world of dramatic pen and tone background effects. In short, would I recommend the manga… yeah, if you’re a fan of the novels, want to experience the Another fandom in chronological order, or don’t want to read the novels or watch the anime but still want to be part of the Another hype. Ideally borrow it from your local library, and watch the anime immediately on Crunchyroll.